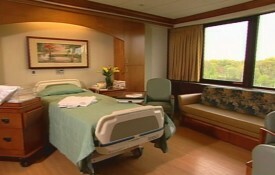 Saint Clare’s Hospital initially retained tvStudio.com to shoot b-roll footage of its new Katina Center maternity unit. 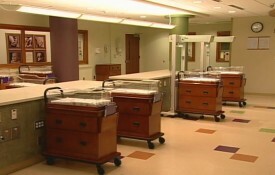 The assignment then expanded to create a concept marketing video geared toward expectant mothers. Our creative team came up with the idea to show how two generations of mothers in the same family experienced the birth of their babies at Saint Clare’s hospital. For the initial assignment, we needed to shoot footage of the newly remodeled wing after construction was completed but before hospital admitted its first patients. This ambitious and comprehensive project dictated that we needed to learn all we could about what was new in the Center, how things were different than in the past, and what has changed about the experience of having a baby in a hospital. We interviewed doctors and specialists. We wrote a script and created storyboards that emphasized the hospital’s long history in the community while highlighting and contrasting the improvements in the new facility. We wanted to show that a mother may often have a strong influence over her daughter’s decision as to where to have a child, and also show that a positive experience and word of mouth from a role model can be very influential. We found old stock footage of the hospital from the 1950s and hired actors to perform our screenplay. We recreated scenes in an older section of the hospital using some antique equipment from the basement storage to show what a delivery room might have looked like in the 50s. Ultimately, the “Generations” video successfully depicted the idea that much has changed in 60 years, but that some things that Saint Clare’s (quality medical care and a nurturing environment) and in life (caring and love) are timeless. tvStudio.com finished the video on time and on budget.